Robi Axiata Limited is a joint venture of Axiata Group Berhad of Malaysia, Bharti Airtel Limited of India (Bharti) and NTT DoCoMo Inc. of Japan (NTT DoCoMo). The entity ‘Robi Axiata Limited’ merged with Bharti’s operation in Bangladesh, ‘Airtel Bangladesh Limited’, in November 2016 to form the new entity where Axiata holds 68.7% controlling stake, Bharti 25% while the remaining 6.3% is held by NTT DoCoMo. 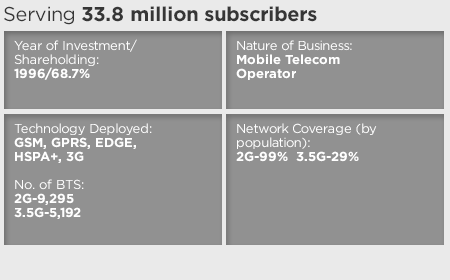 The merged entity is the second largest mobile operator in Bangladesh with 33.8 million active subscribers. It provides the country’s widest network coverage, covering 99% of the population with 9,295 2G and 5,192 3.5G sites. Robi is the first operator to introduce GPRS and 3.5G services in Bangladesh. The Company has introduced many first of its kind digital services in the country and has invested heavily in providing mobile financial services to underserved communities in rural and semiurban areas.